Recession Worthy Food, meet Lunchtime! Now that I’m balancing several jobs and running around Atlanta trying to get to each one, I’ve realized that I need healthy, portable, filling lunches. Cheap lunches too. Luckily, thanks to my pretty big collection of canning jars, walking around with soup in my bag isn’t a problem. And also luckily, organic carrots are really darn cheap. 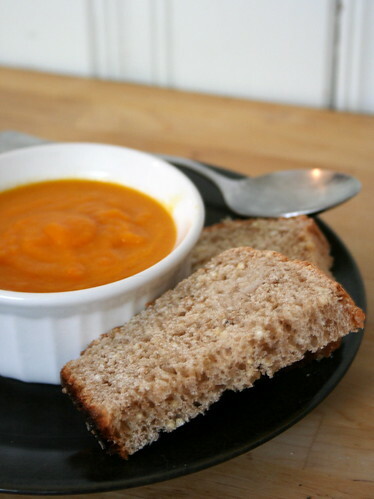 This Carrot Ginger Soup pairs nicely with slice or two of the Whole Wheat Sesame Millet Bread, and besides being cheap, easy to pack, and making enough food for a week, the two recipes taste great together. I guess I’ve got to plan something new for next week though…I know what I’m doing this weekend! In a soup pot, sauté the onion in the oil over medium heat until translucent. Add the carrots, ginger, and broth. Bring to a boil, then lower to a simmer. Simmer until the carrots are tender, 45 minutes-1 hour. Remove the pot from heat and puree the soup in batches in a food processor. Reheat, then serve! That sure is a pretty soup! this is such a great recipe in general. although whenever i make soups that need to be pureed or blended i always add way too much liquid…need to work on that. thanks for this post! I love carrot soups! This looks great! I actually hear Atlanta has a pretty good scene. Probably less flamboyancy on an every-day basis than West Hollywood, but still a presence October is still an odd month for a Pride celebration, though. Damn. It’s cold this morning….I wish I had a bowl of this soup in front of me right now. Great recipe and gorgeous soup! I’m looking for easy, tasty, and affordable lunches to take to work, and this is perfect! Looks great, I just picked up some carrots so maybe I will try it. i’m all about some deeeelicious cheap eats! lunch = my favorite, and the combination of carrots ‘n ginger sounds most glorious! I have a huge amount of carrots to move through – this sounds delicious!